Like it or not, complexity is here to stay. Does that mean that you at the mercy of factors that you can’t see coming and can’t control? Well yes, and the good news is: going with the flow will help you succeed. The horizon of predictability. 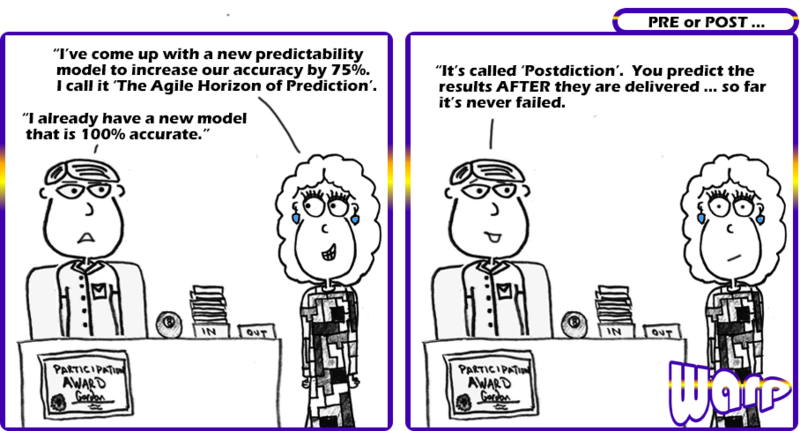 Borrowing from chaos theory in physics, the horizon of predictability is the point at which you can predict the outcome. For example, when you pull a pendulum up really high the swing is erratic and unpredictable. However, if you start the swing from 45 degrees, the swing is totally predictable. In this case, the horizon of predictability is 45 degrees. Time horizon. In organizations, the horizon of predictability is often time. Did you ever notice that 3-year projects are rarely on track? While a 3-week project is almost always a success. This is because there are fewer unknowns in a 3-week period than a 3-year period. The horizon of predictability is the primary factor in why the Agile practice of working in short cycles is so effective. Teams steer away from putting effort into horizons that they can’t possibly predict, and focus on what they know now. Team size horizon. Agile teams also insist that teams stay between 7-9 people. In complex organizations, this often seems impossible. Typically more than 9 people will be involved in most work, but by keeping a core group small you reduce the exponential work needed to communicate and maintain relationships. Once teams become large, outcomes get unpredictable. Someone you didn’t even know about can put the kybosh on progress. The more approvals you get, the more you need. Keeping the decision-making group small keeps the horizon of predictability in view. Work in Progress (WIP) horizon. When too many different things are being worked at once, nothing seems to get done. Think about a time you had to give an estimate on when something would be done, but so many other things were in play, each with their own level of unpredictability, plus unknown work that you don’t even know about yet. It makes giving time and effort estimates almost impossible. Unseasoned managers will try to help by asking “How long would it take IF you had nothing else to work on?” It’s a trick questions because you always have other things to work on. And the effort is not linear. If I tell you that I have 10 projects and if I had nothing else to work on each would take a week, that does not mean that it takes 10 weeks for the 10 projects! Keeping 10 projects in the air has unpredictable overhead. When you get past the horizon of predictability for the number of projects/tasks being worked simultaneously, estimates become a work of fiction. What other things determine the horizon of predictability in your world? Let us know! Older PostComplexity is here to stay, get used to it!